In a bowl or the bowl of a stand mixer, combine water, salt, sugar and yeast. Allow to sit for 5 minutes or until slightly foamy. Add in melted butter and flour, then either mix the dough using the dough hook or knead by hand for 4-5 minutes until the dough has pulled away completely from the edges of the bowl. Place dough in a lightly greased bowl, cover and let rise until doubled in bulk, about 1 hour. When the dough is nearly doubled, bring the 10 cups water and baking soda to a boil. In a small bowl, beat together egg yolk and water for the egg wash. When dough is risen, remove from the bowl and divide the dough into 6 pieces. Take one of the pieces of dough and roll it out very flat. Take the rest of the dough pieces and roll them out into long thin ropes. Try and make them only 1/2 inch in diameter or smaller. Cut a circle out of the flat piece of dough and brush with water. Start from the middle with one of the dough ropes and spiral it outwards on the flat dough. Press to seal. Drop the dough into the boiling water and boil for about 30 seconds. Remove from the water and allow to dry for 1 minute as you repeat the process. Place an oven-safe ramekin onto a baking sheet and spray or grease. Put the dough spiral onto the ramekin flat side down so it forms a bowl shape. After all the bowls are set up, brush with the egg wash and sprinkle with pretzel or sea salt. Bake for 12-15 minutes until nicely browned. Meanwhile, make the sloppy joe mixture. In a frying pan, cook the turkey to brown and remove. Add the onion and pepper and cook about 12 minutes. Add the garlic and cook 3 minutes. Add the tomato paste and cook 5 minutes while stirring. Add in the turkey and crushed tomatoes, Worcestershire, mustard, and hot sauce. Simmer about 30 minutes. To serve, put the sloppy joe mixture into the bowl and top with some cheese. 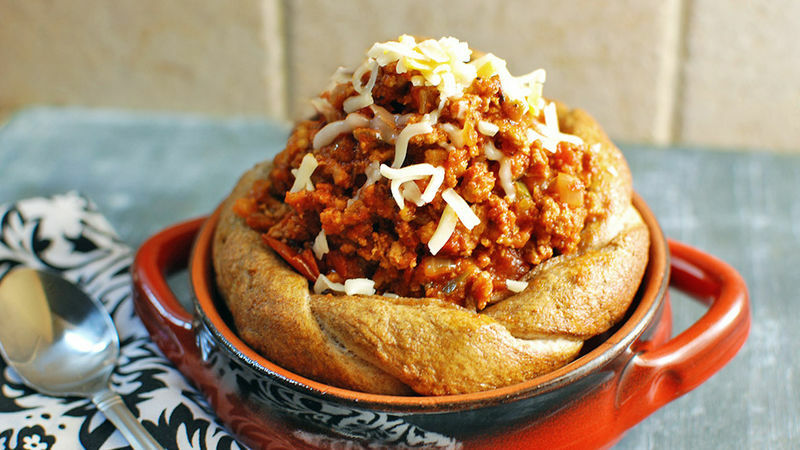 Turkey sloppy joes taste even better when served inside a homemade pretzel bowl! If a bread bowl is a step up from a sandwich roll, then clearly a pretzel bowl is another step up from that. By this logic, I think we can agree that these turkey sloppy joes in a pretzel bread bowl are some of the greatest ever constructed. Think about the flavors for a minute. Everyone wants turkey this time of the year, so ground turkey is an obvious choice. The salty and fresh baked pretzel bowl just takes it to the absolute next level! If you don’t want to bake your own, you can find round pretzel rolls and hollow them out on top to form a bowl. But it won’t be as show stopping as this fresh baked version. For mine, I made homemade soft pretzel dough using this recipe. I mixed the dough first and set it aside to rise while I prepared the sloppy joes mixture. To make your sloppy joes, start by browning the turkey, then remove it from the pan. Onion and pepper goes in next. Add the garlic and then the tomato paste. Then the turkey goes back in, along with more tomato, some Worcestershire and mustard. Just let it simmer for a bit. By this point the dough has already risen. Roll most of it out into ropes, but flatten some out as well. Take your ropes and spiral them onto a flat dough round. This was my fancy braided one, but I also did a more straightforward one. This is the more straightforward one. Anyways, boil this for about 30 seconds and then bake it. Put the flat side down onto an upside down ramekin to bake. After they bake they're puffed up and delicious looking! Then just fill it with some of the sloppy joe mixture. A sprinkling of cheese to finish it off. Hearty and filling, this is the perfect dish for a cold autumn evening! Dan Whalen (@tFimB) wants to eat everything out of a pretzel bowl. He has been blogging for over 6 years at The Food in My Beard; check Dan's Tablespoon profile often to try his recipes with creative international spins!